Workington Comets are under new ownership after Maryport businesswoman Laura Morgan completed a takeover of the Premier League club. 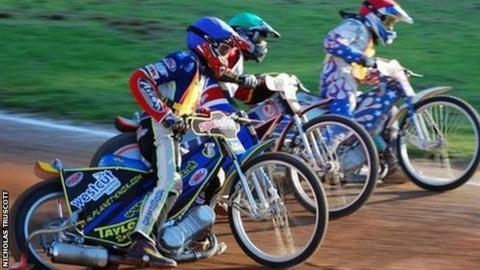 Speedway fan Morgan put in her own money to replace Keith Denham as owner at Derwent Park, who brought the sport back to the town in 2007. Comets are current tenants of rugby league club Workington Town. "I've committed, I've done a deal with the rugby club for an initial two years," Morgan told BBC Radio Cumbria. "But my vision for the club is for five years and beyond." Morgan used money which she received as compensation for a car accident - which left her paralysed from the chest down - to complete the takeover. Denham's decision to sell up the franchise was based on dwindling attendances at Derwent Park, an issue Morgan is keen to tackle. "I'm absolutely delighted, there were a lot of people who were worried when Keith announced there was a possibility the club might close. "But it's great we've come back from the brink to guarantee two years at least, it gives us security and everybody can get behind the club and take it forward." "The root of the problem is getting the supporters through the gates, and I have to cut a deal with supporters who are the most important part of the package," she said. "What we need are people through the gates, my priority is to build the Comets team and I plan to reduce the price of admission fee to get through the gates. "If I have to reduce the admission to get people through than it's worth a try." Despite replacing Denham, Morgan has confirmed there will be little change to the backroom staff, although her brother will assist on the sporting side. "In addition I have Tony Jackson who is staying on as team manager, I'm pleased he's decided to act as co-promoter," Morgan added. "He's very knowledgable, I don't think I could have a better man for the job really. "I'll work closely with Tony, my brother, the track staff and people in place already are going to stay on. "So hopefully we can have a team and push Workington Comets forward."